… and for amazing aubrieta ! These pics are all from my springtime gardens. The first photo was taken yesterday ... yes.. get the cameras ready... and keep on singing ... lol. I'd like to hear you singing along .. lol. I was singing along too...in my head, and the words fit perfectly! well done TT, I have noticed some little bulbs coming up since I got home from my hols....hurray! Hi KS ... pleased you have bulbs coming up .. Thanks Sandra ... glad you enjoyed this .. It's on it's way. My seed potatoes arrived todat and it didn't get dark till 4.30..Well properly dark, as it didn't get very light all day!!! Get chitting Paul! What are you going to do about those mice? You'll need to get a hunting cat! 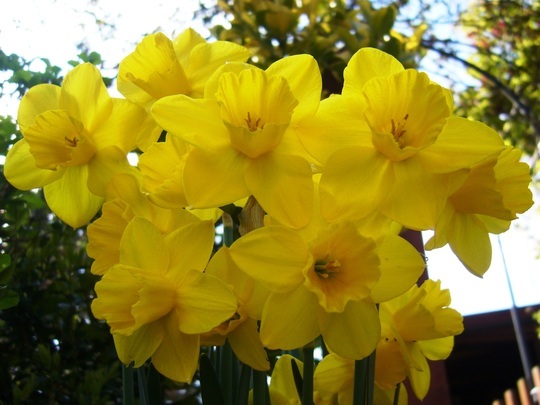 Life without spring bulbs is hard to bear!! Looks like you'd better send Paul a p.m. Karen... You've lots to say ...! Oh, Pam... that's a lovely poem... thank you ! Beautiful blog and such a wonderful selection love the song. Bulbs not yet planted ? Hello Sixpence ... Thanks ..
How did you know I could sing but then again my parents both were Welsh lol. Thank you Terratoonie:o)) lol I aready knew we could get spied on through the pc looking through web cams and from the plug points by the goverment did nt realise you could hear me too. Was we singing in chorus then hehe. I enjoyed it too..really lifts the spirits...I won't bother singing along,not out loud anyway..Lol. Sixpence and Pam singing together ..
And Beattie too - I couldn't resist - and it scans beautifully too! Thanks for sharing your songwriting skills again Terratoonie! :-) And the lovely hopeful pics. ... grrr ♪♪♪ in unison..LOL. what a fantastic blog Terra! now that is using the creative and multi-sensory power of GoY to the full. its gone to the top of my favourites!! beautiful photos ~ as always and so cleverly done!! Totally amazing...as descriptive as anyone can get, pictures, words and song! Some talent you have there, you find a story in almost everything, and present it amusingly, cleverly and it all fits! hehehe Terra, Great blog, I was cheerfully singing away with what seems like everyone else here, we could form a gardening choir...lol! 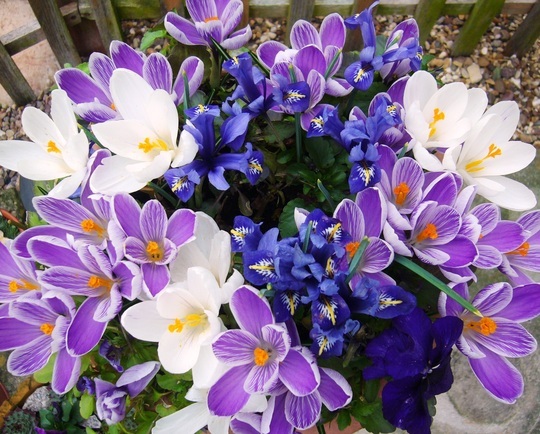 I`m so envious of your beautiful display of bulbs too, they are absolutely...well beautiful! Well, we've taken over Gardeners World, Ground Force and Countryfile...why stop there..you certainly have the X Factor! ... and we'd have Carol Klein as our mentor ..lol. so we all wear scarves and long sleeves? where was it the hound of the baskerville was howling? wasnt that a devon hillside/moor?? 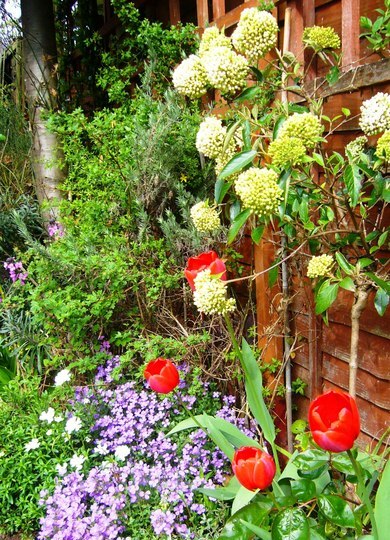 try to get those bulbs planted in time for the 2012 Olympics..
oh yes i noticed those ~ lovely dogs!! i wasnt worried about carol or her dogs!! 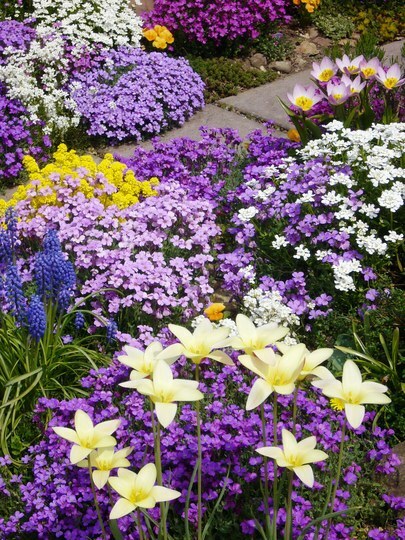 Loved this blog loads of lovely bulbs and what gorgeous shade's of purple your aubretia is. .... you all sang along very well ... ♪♪♪ ...lol..
... yes, aubrieta blooms in so many lovely shades ..
You are a clever girl Tt, a fantastic blog. 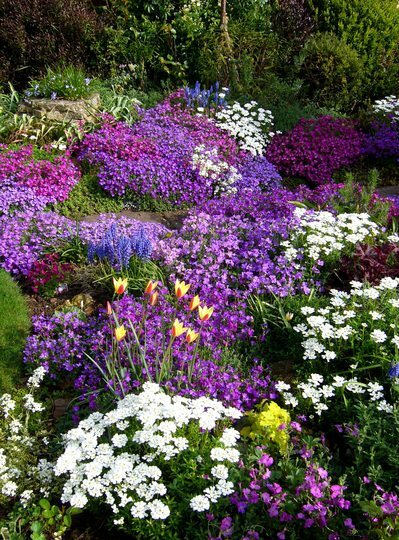 Not too long before we can enjoy lots of colour in our gardens. :o) ... I've just been out in the sunshine and pruned a few roses ..
... it seems your bulbs must wait just a bit little longer ... Lol. I'm pleased you like this blog. 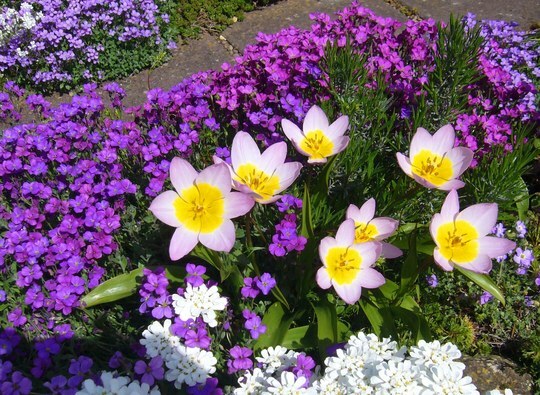 Absolutely brill blog, could'nt help singing along to it, lovely photos roll on spring. Thanks, Yorks and Clarice ..
Wow ... the GoY choir is growing ! Nice to have singers in Yorkshire and Blackpool...Lol. 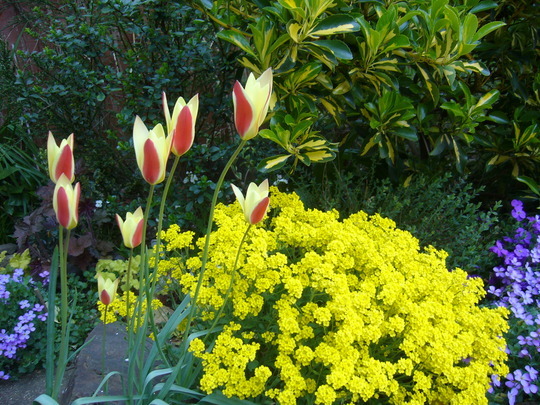 I have been in the garden planting bulbs as well Terratoonie it is a bit nippy still but a cuppa soon warm's you up. a quick sing-song and a hot cup of tea work wonders :o) Lol. ... you've now both qualified yourselves for guest solo performances with the GoY choir ..lol. ....and he's coming out to play! Ah, excellent, Beattie .. another soloist .. ! Hi Sticki... as long as you've had a hair cut, you can join in, and be part of the GoY choir .. I seem to remember a strange singer called Little Willie singing Tiptoe through the tulips, Pamg, very odd. Flowers in the Rain !! i had my hair cut last week and i shall wash it tonight if that would be acceptable? one hair dresser i have seen is called 'tete a tete' ~ that would be a good name too? bit of a close shave there! my aunty gladys used to love him! WE B DOING HAIR N STUFF!! not gilly gilly hassa-whatsisname-by the sea Beattie? Paddy's fine, thank you Tt. And the bulbs Karen susan and Tt. 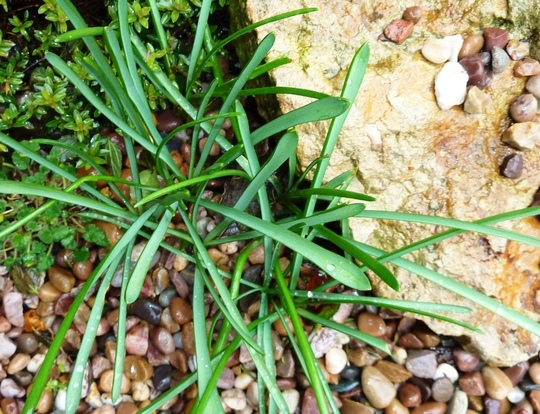 I put some more in (on my rockery), although they were very late going in and I covered them with chicken wire before covering that with the soil. Hopefully, that might keep them out and, hopefully, the shoots of the bulbs will find their way through the chicken wire holes(I tried my best to place them under the holes. I've cleaned it all up today and put two rows of bricks around the bottom of the door.If that doesn't stop them, I don't know what to do. I've put my potatoes in ther to chit so I hope they don't eat those.!!! Or I'll MASH them...the mice , not the potatoes!!!! That's a pity about all the damage done by the mice ..
Paul - sorry, but if that doesn't work you'll need some mousetraps. I reckon they're kinder than poison. Hi TT, thanks for a super blog! I am just trying to catch up with everyone again, now we are at last back on the internet. 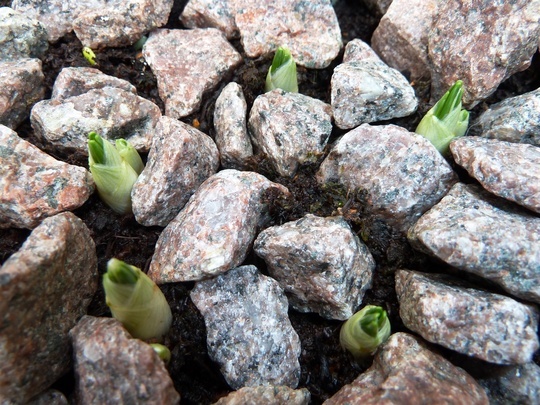 I too have a few little bulbs poking up here and there, its very exciting. 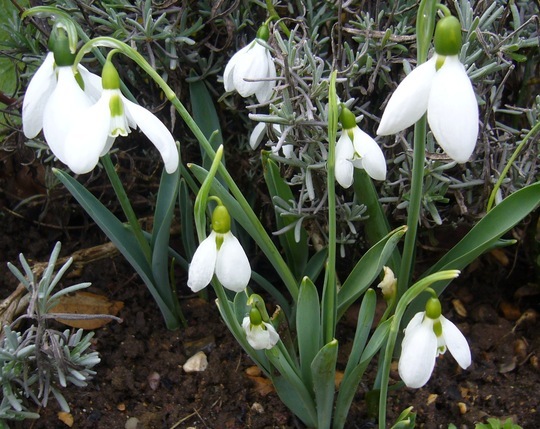 Last year I planted 100 snow drops, I wonder how many will have survived! I think you had better book the Albert Hall. The joy of singing is only equalled by the joy of seeing your beautiful photographs. It beats all those awful videos, that are shown along with some of the modern songs, to a pulp. Think of sending it to Beechgrove Garden they might get Susan Boyle to do a recording for charity. ... there's a lovely thought ..
... Would you conduct for us please ? ;o) Lol. My first appearance as a conductor was my last unfortunately Tt. I was five years old and tall for my age but very importantly I could keep time. At our rural school concert I had to stand on a chair at the edge of the stage. I was so enthusiastic that I toppled off. Luckily the headmaster managed to catch me. The school orchestra and choir went on. I was put back on the chair and continued to conduct. I was never asked to do it again. I think I should stay in retirement. lol. they wont let anyone do that now with elf and safety scotsgran!! I'm pleased you like the blog and pics ..
... and welcome to the GoY choir Lol. Hi TT. Singing like 'Maurice', that shows our age Lol !!!! Lol. "You remember it well ....."
music to my ears TT. Fantastic blog, TT! :-)) I've added it to my favs! You really know how to put a blog together! The photos & words went very well together! Like others I was singing along in my mind - otherwise the floods here would have sent the good 'ol boat Blighty to the bottom of the oceans! ... entertaining the passers by ... lol.. I hope none of the flood water came too close ! ... Balcony's balcony is ground level, so Romeo wouldn't have to climb up very high to reach Juliet..
... found that on the internet ! My Grandma told me about all these songs ;o) lol.. I heard it when Graeme Garden sang it on a radio programme - "I'm sorry I haven't got a clue" where he sang along to a recording, then it was faded out for a while then back in again to see if he was "within a gnat's crotchet" of the original. The "Inch Worm" song is very welcome as long as we don't have so sing the metric version..
... "25.4 Millimetre Worm" lol. measuring a marigold...was it bing? LOL, I still measure the old way Terra and you`re right it doesn`t have the same ring to it..
was that same time as puff the magic dragon? 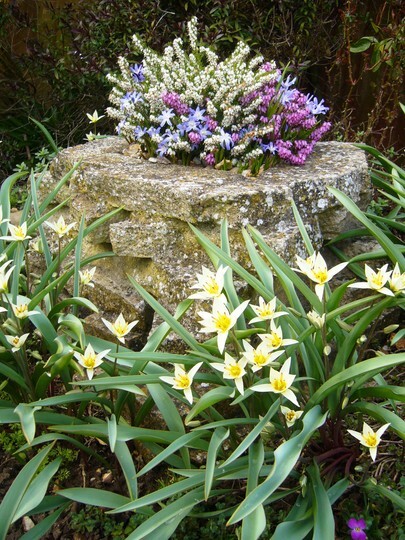 compton acres is well worth a visit pam ~ i have been more than once, ~ i loved puff the magic dragon ~ i hope he is very happy in your garden!! what is the 'listen again' programme? i have heard the petunia one TT, thanks pam ~ thats a funny song. i like the iplayer, its very useful ~ i like radio 4 but they do seem to repeat things ~ iplayer means i dont have to listen to the repeat! How about 'Torchy' the battery boy?? I loved it. According to the internet, the flipside of Tubby the Tuba is The Little Fiddle, year of release: 1945 ... some these songs really are going back way before my time ! and me Tt-- I'm a baby boomer! I'm a pink toothbrush, your a blue toothbrush, have we met somewhere before!!!? Ooooooer, dont know that one TT !! Chalice in the palace was from the Court Jester starring Danny Kaye, Pamg. I loved him when I was young and saw the film a couple of times, sitting through it twice! One's that I can remember ,Morningtown Ride, The Runaway Train, and there was one about a unicorn ? Puff the magic dragon?? We must have all listened to Childrens favourites! i dont know many of these but its probably cos we had no tv and no radio in the house till i was 8 ~ and then only allowed listen with mother, story time and news!!! do you remember the story of sparky the magic piano?? Do you know Sticki, Sparky and the magic piano was one I was going to mention. It was on Children's Favourites ever single week, without fail, and I got SO bored with it!! I don't remember The Little Fiddle at all Terra - I wonder if we had a different version of the record? My Dad used to travel a lot and could be away from home for 6 months at a time. One time he met someone who was in the production team for Children's Favourites and got them to play a record for me & my brother. Mum sat us down and made us listen to the whole programme, waiting for a surprise - and they played The Laughing Policeman "for us"! There were records we liked better, but he did try! The playlist for that programme was SO restricted - they must have played the same 15 "children's" records every week. The only difference was the order they played them in! I just loved Sparky and his magic piano, those were the days! how lovely to have a record for you!! i remember the laughing policeman! my dad loved it! i liked sparky but we didnt listen to childrens favourites. i think dad had sparky on a tape recorder? we had a record with the pied piper of hamlyn on it but it had a scratch so it only said 'the leg of his trousers was o!' ~ strange things i remember!!! Oh wow, I remember all of the above, I`ve been sat here singing away,lol, absolutely loved childrens favourites and David Whitfield was a big favourite of Mums when we were little so we had most of his records, I bet a lot are still in the loft at dads, another fav of mine is Terry Scott ( I think) singing Camp Grenada..
'my ole mans a dustman'-- lonnie donnegan?? I'm not too young for Muffin the Mule :( I also remember Annette Mills with Prudence the kitten and I still have my kitten puppet bought for me when I was about 8!! the last line was sung very deeply! post it on the GoY site right now!! ~ does that fit lincslass? Camp Grenada was hilarious, Lin.c. Lol! Do you remember the american guy who made records about a driving lesson and Sir Walt.? They were very funny. Thanks to the very talented Terratoonie I loved that lol you have really given us all a taste of what is to come and what a beautifull garden. Anyone remember Tinga and Tucker, and another song'She will be coming round the mountain. I sing that one every day with my grandson, Mavis. Bless him he loves it. Oh yes Mavis, also know of quite a few changes in the verses as the years have gone by,lol. Good luck with your spring garden ..
no showers here but i think i might put up some of your photos TT ~ to remind me of how good a garden can look! that's a great blog terra, it cheers you up in these cold wet days. ive been out in the garden but shamefully not to do any work ~ i had a cup of tea and read some of the paper!! was the tingha and tucker presenter aunty jean? ... I'm sure you sang along beautifully ;o) lol. thats the trouble ~ i only have Minty my cat and she is not a gardener ~ neither is she as well trained as your two helpers! she doesnt even like having her photo taken!!! Lovely blue sky in Cornwall - and b****y cold with it! Planted my market-bought cyclamen and primmies. 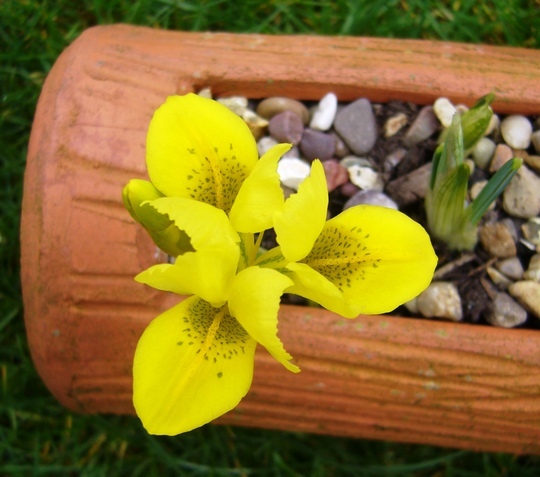 Lovely cheery blog and pics, Thanks. What colour, what a giggle!! Well done the very talented TT!! And as for song lyrics....what about #And Diamond dogs are poachers and they hide behind trees'.............not sure why that one came to mind but it did, sorry! but you are nearer to 100 comments now! It seems to have jogged memories of many old songs ! oops, I meant 200 comments!! GoY has a very ♪♪♪ musical ♪♪♪ membership. Lol. "The diamond dogs are poachers"
David Bowie. Diamond Dogs ... song. 1974. I'll sing it for you if you like!! I present you with a 'Truffle' Award for 200 comments, Terra! 201! am humming away, just! and i read this backwards again! Request programmes on bbci player - Dewi Griffiths 'A String of Pearls' and David Lowes' 'Swingers and Singers' on bbc South west local stations (Bristol,Wilts. Devon,Somerset etc.) at 8pm on Sunday evenings are both very enjoyable and offer an entertaining alternative to TV. One advantage of the computer is that you can listen to programmes you miss or have heard when in a different region. I'ma radio fan and not too intersted in TV. I tend to fall asleep half way through. i cant sit still long enough for most tv. radio is nice cos you can do something else at the same time. i like some radion 4 but bit too much news and several repeats. I'm a Classic FM regular. Especially when I am driving. i like the archers if im driving along. some classic FM but not so keen on the presenters ~ i like the five live team but theres too much sport on that! You are right Hywel about String of Pearls. My car radio switches to Radio Wales coming up through Bristol and I get it for a good few miles up the M5. My husband was the junior Radio Officer on the Dunera taking the Anzacs back home after the war and it was his job to DJ the entertainment. He recognises all the artists and band leaders the minute a disc starts playing. Listening to these programmes is as good as a tonic. Wow! Are you going out tonight Pam? That's one classy updo you've got there! Eat your heart out Marie Antionette! Or shall we call you Medusa from now on? Its a 'beehive'-- was it dusty springfield who started them? Let's be a bit more up to date here girls, Amy Whitehouse-esque. I'd wear that hairdo really, if I could sing like her . Davros..that's right Pam..it was on the tip of my tongue lol..the evil genius behind the Daleks. Tetrarch and the FPP...it figures. I think one of us should keep an eye on her, round the clock surveillance is what's needed here ¦:-| anyone seen my hat? 3 Christmas songs .. CLUE NOW ADDED FOR SONG 2.